North Bali is a coastal area in Bali. This is an area far removed from the hectic pace that can be so apparent in South Bali. In Dutch colonial days, Singaraja with its port and easy access from Java was the administrative capital of the island. Touches of that history still remain with the noticeably wide streets and the occasional old house which has retained the large gardens which would have pleased the Dutch so much. This combines to give Singaraja a different feel and atmosphere to any other town or city in Bali. 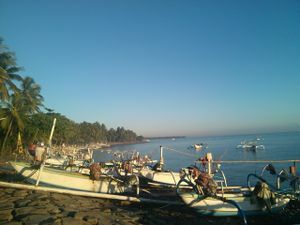 Lovina is the other area of the region often visited by tourists. The name Lovina was actually coined for tourism development purposes in the 1950s and consists of three traditional villages along a stretch of black sand fringed coastline. Development has been a bit haphazard here but that just seems to add to its laid back charm. Lovina is popular with visitors who want a beachside holiday in Bali but do not want the hectic pace of the resort regions of South Bali. 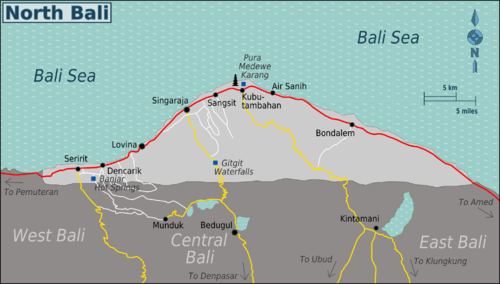 There are several routes used to access the northern region of Bali, some much more often used than others. From the south. The main road through the highlands comes down the northern face of the central mountain range and continues into Singaraja. This is a picturesque drive. Driving time from Bedugul in Central Bali about 1 hour, from Ubud about 2 hours and from the main tourist destinations in South Bali, about 3 hours. An alternative and even more scenic route involves turning west at Lake Buyan in Bedugul and heading through the village of Munduk and onto Seririt on the north coast. From there it is about a 20 minute drive eastwards to Lovina. This journey can take as long as you want it to. Take your time and really enjoy the magnificent scenery. From the east. The east coast route into north Bali goes through some very barren terrain with stark views of Mount Agung across flat gravel plains. From Amed the drive to Singaraja will take 1 hour to 90 minutes. There is a less used route which comes in from the highlands at Kintamani hitting the north coast road at Kubututambahan, just east of Singaraja. From the west. The road follows the coast from Pemuteran in West Bali to Lovina through some lovely, laid-back coastal villages. Driving time about 1 hour. There are scheduled shuttle buses to Lovina from most major tourist destinations in Bali. These are reliable and cheap. Check the advertised services locally and book one day in advance. Perama  has an island-wide network and a local office in Lovina at Anturan. Bemos servicing Singaraja depart from Ubung terminal in Denpasar. Many visitors to the region arrive with their own hire car. It is possible to hire both motorcycles and cars in Lovina with Kalibukuk village being the best bet. 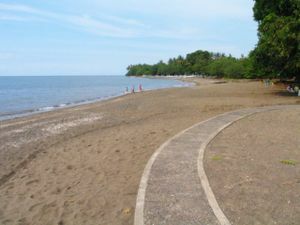 If you intend to enjoy just the beaches and associated life in Lovina, then you are best served by walking. Regular local bemos do ply the coast road between Singaraja and Lovina and beyond. Just hail when you see one. A day spent exploring Singaraja would be a day well spent by any visitor. The former colonial capital of Bali has long been subject to international influences and this still manifests itself today in the very nature of the city. The streets are wider than anywhere else in Bali, the gardens larger and there are some distinct ethnic communities reflecting the city's past as the major transit point into Bali. Just behind the waterfront and defunct harbour, check out the Kampung Arab (Arab village) district and the maze of distinctly old fashioned trading streets. The local Balinese clearly have a taste for large monuments and you will see these dotted around the city, usually at major junctions. The winged lion symbol of the Buleleng Regency is to be seen all over the place. The most interesting specific attraction in Singaraja is the Gedong Kirtya Museum which sits at the junction of Jalan Veteran and Jalan Gajah Made. This museum is dedicated to the preservation of Lontar scripts. Lontar is species of palm tree and its leaves are an ancient medium for recording the written word. The museum houses thousands of these delicate pieces covering subjects as wide ranging as religion and the folklore of traditional medicine. Very much worth a visit. The museum is open Monday to Thursday from 7.30 AM to 3.30 PM and on Friday mornings. Entrance is free but a donation requested (and you really should support them). The library staff are notably friendly and helpful here. About 10 km east of Singaraja on the coast road is Pura Meduwe Karang, the most impressive temple in north Bali. This unusal temple is host to all manner of stone carvings, many of them ghoulish. The temple is dedicated to Ibu Pertiwi (mother earth) and daily offerings are made to ensure that crops grow on infertile ground. That may sound odd until you go to North Bali and see how inhospitable so of much of the terrain actually is. 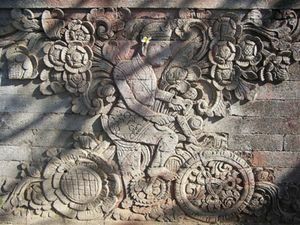 There is a famous sone wall relief here that is testament to the wonderfully quirky Balinese sense of humour. It is a one metre square represenation of the Dutch artist Nieuwenkamp, who biycled around Bali in the early 20th century. The bicycle wheels have lotus-flower spokes, Nieuwenkamp is adorned with a floral sarong and flowers abound in the background. Between his feet and the wheels is a rat and a dog. This famous image has been copied many times. About 7 km further east on the coast road are the cold springs at Air Sanih and a visit here combines well with Pura Medewe Karang. The whole of this region is famous for its black sand beaches and none more so that the long stretch of coastline to the west of Singaraja known as Lovina. There are many access points to the beach here and the coast road often runs very close to the sand. Perhaps the best and most well known is at the village of Kalibukuk where you should turn north and take the small road down to the dolphin statue where ample parking is available. Explore the beaches east and west from here for a real sample of life on the north coast of Bali. There are lots of opportunites just to laze around and take it all in. canyoning: "Adventure & Spirit is reputable company that organize canyoning tour in this area. This activity is an ultimate outdoor adventure and sport using a variety of techniques that may include walking, abseiling, jumping, sliding down natural slopes and swimming in white water for aquatic canyons. And of course discover beautiful and hidden place at the heart of Balinese nature! If you want to go in non commercial area and feel adventure, do not hesitate. Diving and snorkelling are popular activites on the north coast and can be easily arranged either direct with dive operators or through your hotel. 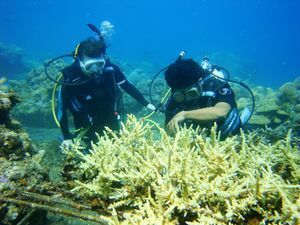 The best dive sites are at Tulamben and Pemuteran, outside of the region, but Lovina is good base for exploring both. Les Village in Tejakula is famed not only for its Yeh Mempeh waterfalls but also for sustainable ornamental fishing and coral reef rebuilding activities of its fisherfolks. At Sea Communities scuba divers, snorkelers, and nature lovers could dive, learn how to catch ornamental fish the sustainable way, plant corals and rebuild reefs. Take a pleasant trip to Pegasus Farm.Just a ten minute drive into the hills above Lovina past the well known Hotel Damai, youll find a large organic farm overlooking the Lovina bay at the end of Kayuputih village. Available here are fantastic horse riding treks through the tropical jungle and balinese villages. Suitable for all ages and levels of experience.The perfect place to to take your family, friends or partner. A dawn boat trip to see dolphins off Lovina is an ever popular excursion and again, is easily arranged. Spas in the north are low key and rather basic compared to the opulent options in south Bali, but the treatments are excellent and the prices extremely good value. All of the main hotels in Lovina have restaurants with indoor/outdoor dining and seafood barbecues are popular. The Lovina beachfront at Kalibukuk is the best bet for independent eateries. For a real local experience, try the stilted waterfront restaurants on Jalan Erlangga in Singaraja. Lovina has a bit of a bar scene, especially at weekends. Look out for local flyposting, leaflets or ask at your hotel. Lovina has a huge number of budget and mid-market accommodation options and for that reason is popular with both budget travelers and vacationing families looking for a good deal. East of Singaraja in the area between Kubutambahan, Bukti, Tejakula are some private Villas. Located in Tejakula is the Cili Emas Beach Resort. Cili Emas cooperates with Bali Samadhi Spa and you can enjoy all spa treatments in the comfort of the resort. Travel south through the central highlands to visit the mountain villages and waterfalls of Munduk and the lakes and Ulun Danu Bratan temple in Bedugul. Onto West Bali for diving and snorkelling at Pemuteran. A swing around the north coast into East Bali to stay at either Amed, Candidasa or to explore Mount Agung.